Windstar's ships are officially motor-sail-yachts (msy), but the designation belies the vessels unique rigging. Unfurling in two minutes at the push of a button, billowing white sails reach to the sky. All functions are operated from the bridge by computer micro-chips and navigational devices. The unusual "open-bridge" operation allows guests to drop by and acquaint themselves with the veteran captains and officers who demonstrate the ships' intriguing capabilities to modern day explorers. Seattle-based Windstar Cruises operates the 312-passenger Wind Surf and 148- passenger Wind Star and Wind Spirit. 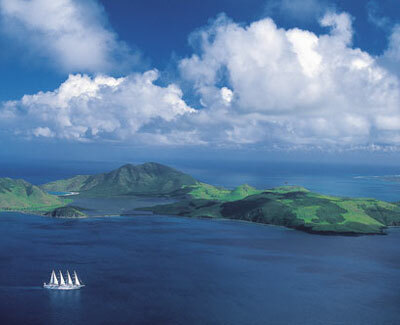 The three sailing yachts cruise to over 47 countries worldwide offering an affordable luxury vacation. The msy Wind Song was retired to the Sea of the Moon in January 2003.